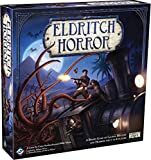 To resolve a test, the investigator rolls a number of dice equal to his value in the listed skill, taking into account any effects that add or subtract from his skill. Investigators roll a minimum of 1 die on each test. If he rolls at least one success (a "5" or a "6"), he passes the test. If he does not roll any successes, he fails the test. The number of successes rolled is called the test result. When an investigator passes or fails a test, he follows the original effect's instructions for the matching result. Example: Lily Chen has an "Arcane Tome" Asset card which reads: "When you perform a Rest action, you may test . If you pass, gain 1 Spell". When resting, Lily resolves this test using her Lore ( ) of 2. She rolls 2 dice with results of "1" and "3". Since she did not roll a "5" or "6", she fails the test does not gain a Spell. An investigator can use only one card effect that provides a skill bonus during each test (for example, an Asset that reads "Gain +1 "). If he has multiple card effects that provide a bonus, he uses the highest bonus. On many cards, tests are declared using their skill icon embedded in parenthesis following a short narrative. When an investigator is resolving an effect that includes a skill icon in the text, he must immediately test that skill. The test declaration may also indicate a modifier (such as "-1"), which causes the investigator to roll more or fewer dice in the test. Note that most gameplay terms are capitalized on cards to help differentiate them from narrative text. Immediately after rolling dice during a test, an investigator may spend a Clue token to reroll one die. He may perform this multiple times, as long as he spends a Clue token each time. He determines whether he passed or failed after resolving all rerolls. 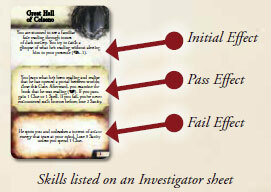 Each investigator has five different skills listed on the bottom of his Investigator sheet. The number below each skill is the number of dice the investigator rolls when resolving a test. These tokens represent an investigator's training in particular skills. When an effect allows an investigator to improve a skill, he gains an Improvement token with the matching icon and places it below his Investigator sheet with the "+1" side up. If he improves that skill a second time, he flips that token to the "+2" side. An investigator's skill is equal to the value printed on his sheet plus the value of the matching Improvement token. 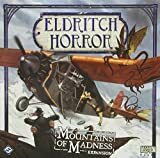 Expedition Encounters, Other World Encounters, and Special Encounters are rewarding but dangerous adventures called complex encounters. Each of these cards has three effects. To resolve these encounters, an investigator first resolves the initial effect (the top box of the card). Depending upon the result of this effect, he immediately resolves one of the other two effects. If he passes the test in the initial effect, he resolves the card's pass effect. If he fails the test, he resolves the card's fail effect. He resolves the entire effect in the appropriate box (which may involve additional tests), then discards the card. 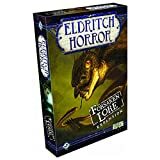 If an Other World Encounter card instructs an investigator to "close this Gate", he discards the Gate token from his space. After resolving an Expedition Encounter, the investigator moves the Active Expedition token to the space that matches the newly-revealed top card of the Expedition Encounter deck.